I'm not sure why not having the lantern is a problem if you have the fire rod? It still gives you the lighting effect to see a little ahead of you even if you don't have the lantern. basically all it does it light torches from short range? 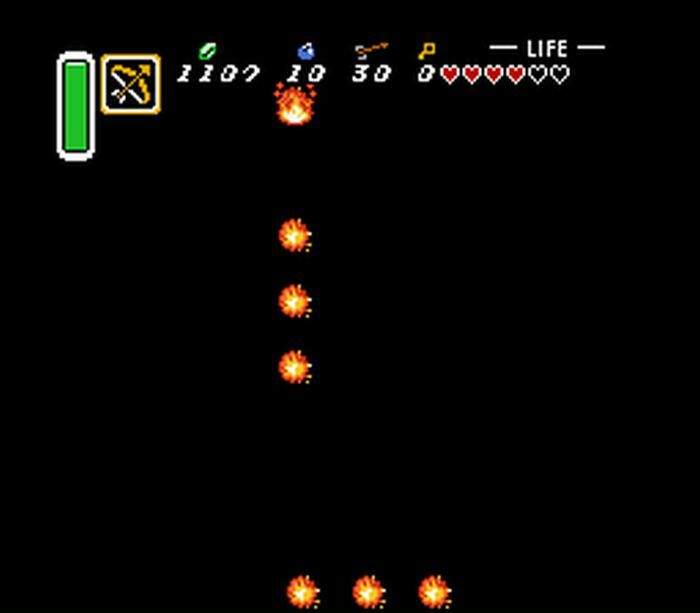 ^In the Dark World, the Fire Rod doesn't provide any light in dark rooms, not even the little amount that is usually in front of you. The lantern is required for that. I'm pretty sure the modified ROM though gives you the larger light circle as the lantern usually does without having the lantern. ^Only in the Castle at the beginning of the game. 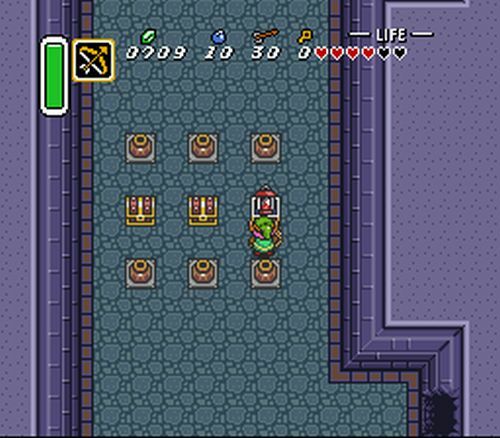 In my run, I didn't have the light circle in Turtle Rock, Dark Palace, or Misery Mire until I found the lantern late game. You're sure it's not like an emulator issue or something? Given, I've never been to that particular dark room without it but I've been to several others and the game never cared if I had the lantern or not. It'd be weird if the game suddenly check if it was in your inventory. When I didn't have the lantern, the rooms were completely dark. When I had the lantern, the rooms had the light circle that the lantern provides. There was a very clear line between me having the lantern and me not having the lantern, because I went into all three of those dungeons both before and after getting it. The Fire Rod definitely didn't do it. edit: They made it so that you don't need the lantern in the Light World, but still need it in the Dark World. Huh. Well I guess I was wrong, sorry about that. I'll forever hold this against you. 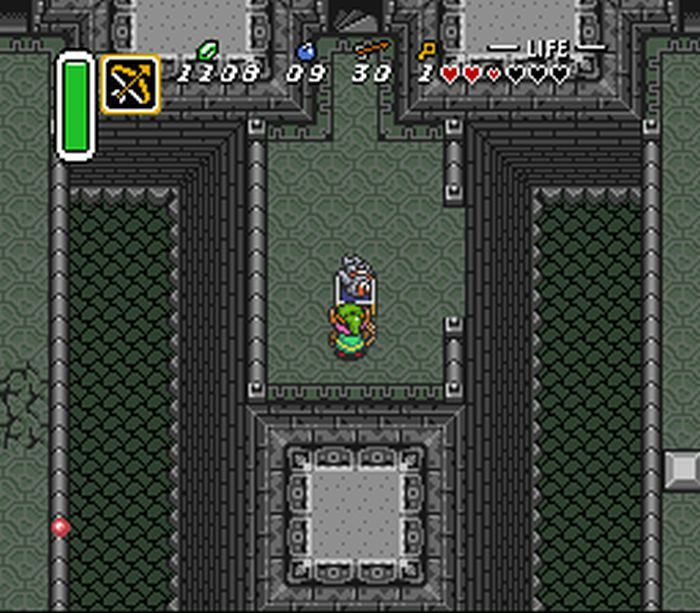 So I finally had a chance to play some more and since I was pretty much stuck not being able to progress in the Light World without the Power Glove or the Hammer but have the Mirror and Moon Pearl decided to tackle the Palace of Darkness. Luckily the Power Glove was found! Of course without the Hammer and the Lantern I couldn't really progress much further into the dungeon. But I could finally go exploring some more. I decided to head north and toss something into the circle of stones..
Wow. Thanks, buddy. 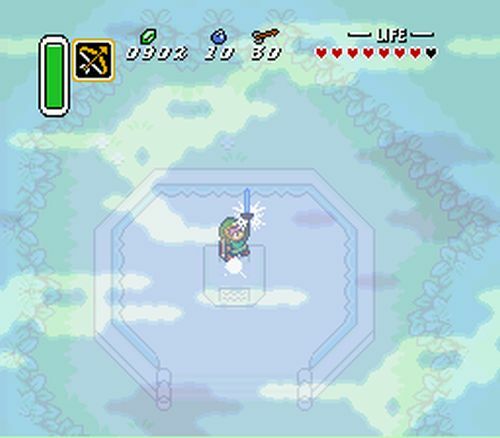 So I used the mirror and headed further north to see what the King Zora would give me. 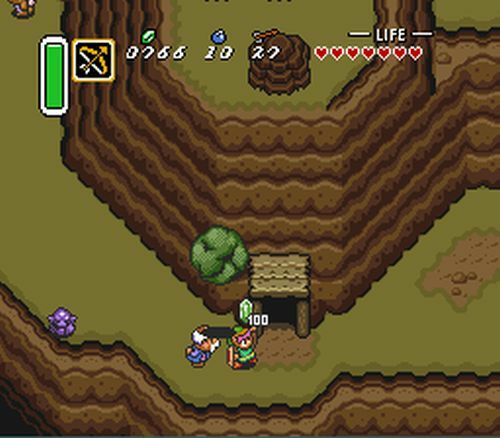 ^I'd suggest maybe checking out Skull Woods and Thieves' Hideout next, since you can get the dungeon items without a whole lot of requirements. With the powerglove he can also get up death mountain now. 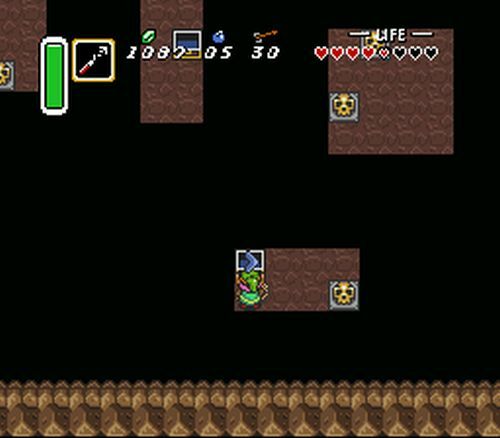 Remember all those completely mundane chests covering the eastern half that are normally filled with rupees? 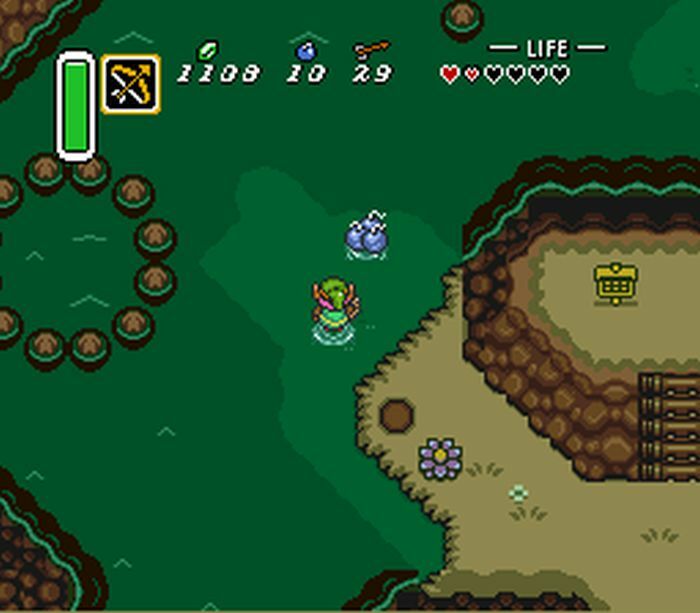 So how many of you got Arrows, Bombs, or Rupees from the Zora King? ^I got a solid ten arrows from him. Nice guy. Mine was at least a piece of heart. I think I got rupees from the ether. The only problem is you need the hookshot or hammer to get to the eastern part of the mountains. Which I did not have yet. With the Power Glove I knew I could at least explore some of the mountains however and at least get through the Tower of Hera. First things first though was the small bombable or Pegasus boots room in the escape route from Hyrule Castle. Seems the Lantern was hiding in there all along. Went up the mountains as usual. For helping him the Old Man gave me some rupees. Guess he decided to take his wealth with him. Could not reach the eastern part of the mountains without the Hookshot so headed to the Tower. Spied the Hookshot on top of Spectacle Rock. Went to the Dark World and back as usual. I tried the cave where you usually get the Cane but forgot you need the Hammer. Of all the items to find I found the Titan's Mitt in the Tower. 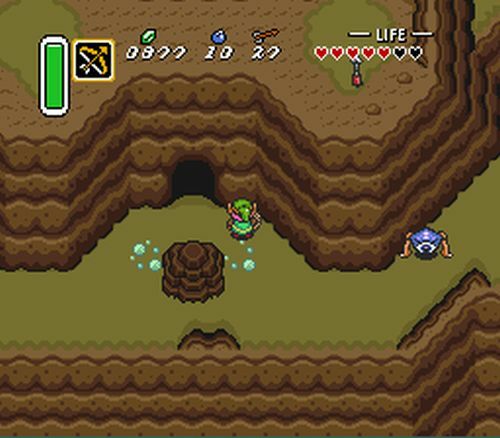 After this I decided to go finish the desert dungeon and grab the Master Sword and get that extra boost in my attack. Not sure why AI's ROM kept bugging out on him but it let me get it. 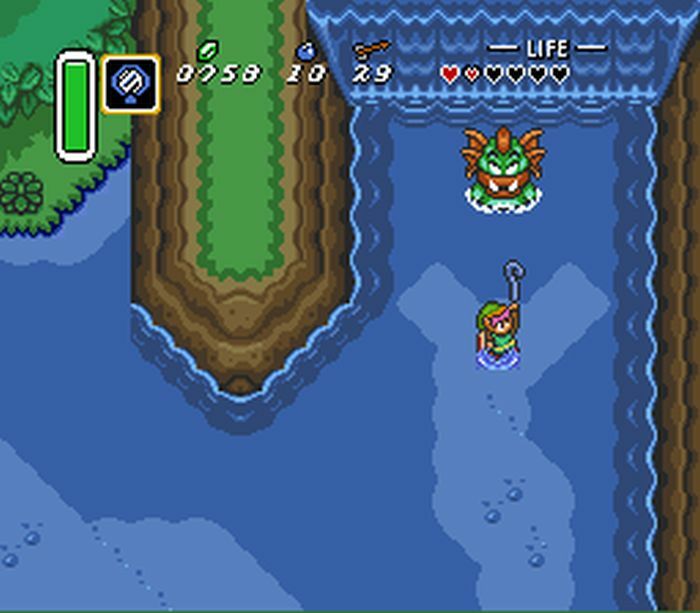 With the Master Sword and the Hookshot I decided to explore the eastern mountains as Crav suggested. Worth it as I found another bottle, the Fire Rod, and the Boomerang. ^ Always liked that last room. It's completely like "eh I'll just slap this together and finish it later, squares are good enough for now" and then they forgot.